This wrong is the new right. Taking a cue from children’s beloved way of wearing glasses flipped around, MYKITA + MARTINE ROSE presents SOS – an acetate sunglass model made to be worn upside down or downside up. Either way looks perfectly offbeat, mimicking the accidental cool of kids’ style. The generous, cropped cat-eye form presents a fun-meets-chic aesthetic that carries on via animal print colorways in zebra, leopard and giraffe patterns. SOS arrives in supermarket-inspired packaging with a ‘sticker’ inscription on the lens for a faux-discount look that seals the statement of nonchalance. SOS by MYKITA + MARTINE ROSE will be exclusively available in the MYKITA E-shop, at ssense.com as well as at Dover Street Market and LN-CC on 24 January 2019. The frame will arrive to all MYKITA Shops and selected fashion stores worldwide end of February 2019. 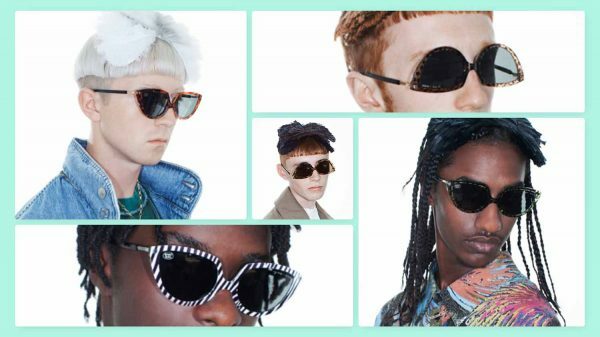 MYKITA does not need an introduction while Martine Rose is new to the fashion scene. Founded in 2007 as a men’s shirting brand, Martine Rose draws its inspiration from the experi­ential tension between individualism and belonging; exploring the potential of clothing to serve as cultural signifiers. By exploring both personal and imagined histories, Martine Rose takes icons or motifs from the past and reimagines their use in the present – contexts are subverted, references collide, and the result is what makes each collection feel ‘offbeat’, and yet so ‘in tune’. Volume, proportion, and fabrication are used in an equally dynamic way to blur the lines between the familiar and unconventional, questioning the former functionality or past popularity of certain aesthetics through their re-appropriation today.